In an average workday, your colleagues and employees don’t perform just one task. So, your office chairs should be flexible enough to provide them with the required comfort. With all those meetings, conference calls and planning happening in the company, your revolving office chair needs to be as comfortable and flexible as possible. If the office staff is constantly distracted due to discomfort and poor design in your seating arrangements, then you are not getting what you need from your office furniture. An executive chair speaks volumes about your workplace. While it is important that the chair aligns perfectly with the décor of your office, at the same time it’s not reasonable if the chair is not ergonomically designed. If the employee is constantly shifting on the chair to prevent strain on the neck or back then they will not be able to focus on the task at hand, resulting in a decreased productivity level. 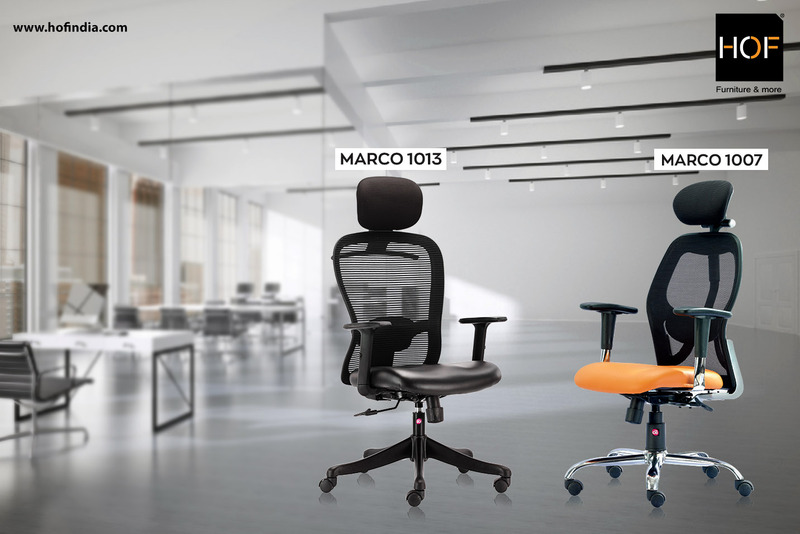 A chair like Marco 1013 gives you varying adjustment options along with cushioned seats, thus making it one of the most comfortable office chairs. We all are familiar with the phrase, “You never get a second chance to make a first impression”. This holds true in the case of visitor chairs of an office as well. Impressing the guests with visual beauty is certainly a part of first impression but comfort of the sitting area is what they will remember eventually. A computer chair is an investment worth making for everyone’s comfort. The choices in the category are varied so it would be wise to get inputs from the people who will be using it the most. Variety of chairs and their functions go a long way in in fulfilling all the needs of your workforce. By providing them with a comfortable as well as a visually pleasing chair, you enable them to enjoy the work while they do the best job for your business which creates a win-win situation for everyone. Redesigning your office? Visit shop.hofindia.com for a variety of ergonomically designed chairs! Get latest articles about Furniture Trends.